Philips showed off some interesting prototype 3D technology at its IFA press conference today. The company is calling it a: "special prototype 3D version of the Cinema 21:9* TV with 3D content provided by a prototype version of a Philips Blu-ray Disc player." There's no word on when Philips will release this into the market-place but it does prove that ever TV manufacturer is looking to 3D as a way to bolster its TV sales. Philips explained the reason that it is using its 21:9 TV to show off 3D, by saying: "it could be a possible future direction for totally immersive home entertainment. "As part of our ongoing Cinematic Viewing Experience program (that has already produced the first 21:9 format TV (Cinema 21:9) and the unique Ambilight system) Philips took a next step to experiment with what an immersive 3D viewing experience could offer to consumers." Echoing the BDA's thoughts on 3D, Philips also said that Blu-ray was the future for 3D technology, explaining: "We believe that the Blu-ray Disc format, with its high capacity and pristine picture quality, is the best carrier for the 3D experience in the home. "Once movies start to become available in 3D on Blu-ray Disc, consumer demand will naturally increase. Therefore Philips is actively participating in the 3D specification work of the Blu-ray Disc Association. 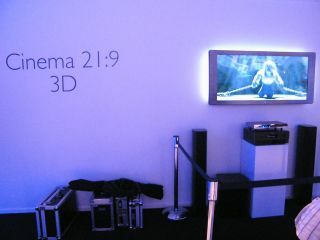 "The 3D content in the IFA 2009 presentation is provided by a prototype version of a Philips Blu-ray Disc player." When TechRadar chatted to Philips' spokesperson about the technology, they told us: "Philips is working on all types of 3D. At the moment we are looking at a polarising lenses with with passive glasses. "It's not clear yet whether consumers are ready to wear glasses or not wear glasses. When the market is ready, we will deliver a proper announcement."